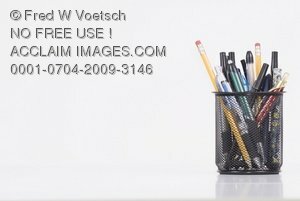 Description: This is a Stock photograph of a variety of pens and pencils of all shapes, sizes and colors in a pen holder. This image is taken on a white backround to make space for text or whatever you may need. Disclaimer: You may use this image for free by copying the link code provided below. The copyright holder may restrict use at any time in any manner. You may not sell or distribute it without permission from the copyright holder. You are responsible for any liabilities arising from your use of this image.